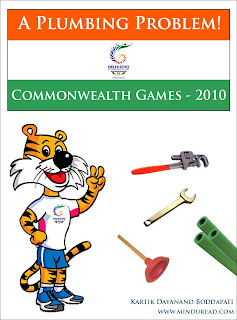 It is stale news by now, every single media outlet has been ranting about the rot that is the Commonwealth Games 2010 (CWG) preparation. Most have done a good job in highlighting the sorry state of affairs. Ironically most of us common people along with the media are experts at dissecting dead bodies, good at creating post mortem reports but rarely do we ever propose any remedies to not let anything like this happen in the first place. Not just these games, in fact this is a game that is played out every day in various parts of our country in various departments and sectors. The noise we make about the mismanagement of these games only highlights our ignorance of the way this country functions. I am glad that the Commonwealth Games are happening in India. Also extremely glad with the way things are progressing. It is time we woke up to the reality that is India. My above statement could be pretty confusing as to what I really intend to say. Am I excited about the games or am I skeptical? Answers to this I will try and give by talking about a lot of things that have been coming to my mind over the last few weeks. So here they are, please feel free to let me know what you think about each of the things that I talk about here. I spent five years of my life studying Architecture. Project Management was also a critical part of it. Yet the importance of Project Management hit me much later in life while I worked in various industries and organizations in different capacities, dealing with both local industries like Bollywood, Real Estate majors and overseas clients like Disney and Electronic Arts. More the experience I gained from them the more I came to realise that the very essence of project management is the same whatever be the industry: Architecture, Animation, Films or be it the running of Software Firms or Governments. All of them have one thing in common - PIPELINES! It is interesting to note that the one feature highlighted most by media with respect to CWG preparations is the leaking roofs and walls. This is quite symbolic of the way the entire process has been handled with leaks everywhere in the system and not just in the pipelines that carry water. It’s also quite an interesting metaphor of art imitating life. That is if you consider our stadiums to be pieces of art in the first place! A project is nothing but a series of tasks performed by different departments, which are all interconnected and interdependent for the completion of the work. What is essential for their correct functioning is smooth, timely and transparent communication between various departments, which is very similar to the structure of our pipelines that carry water. If there is a clog or leak in one part of the pipe the entire system suffers and there won’t be water supplied where it is desired. It’s pointless asking the tap why there is no water today when the problem is with the pipe. Ask any department working for the CWG, pick anyone, am sure no one would take the blame for any of the delays. They would simply pass the buck to the department which was to pass on the work to them. This leads to extreme pressure at the end of the pipe when things have to flow in the form of a flood as deadlines loom whereas a steady trickle would have sufficed if the pipe was clean. Plumbers, Leaders and a Small Quiz! So who takes care of these pipes? In case of the plumbing system in our house it is the architect of the house and later on the plumber who takes the mantle of designing and maintaining these pipes. It is a critical function and needs an expert to be handling this task. But what do we do when it comes to maintaining the pipeline of a project as prestigious as the CWG or any other major project undertaken by our government? We leave it to politicians who are least qualified to manage such gigantic projects which require foresight and expertise. Leaders who can get the right pipeline designed and oversee it till the completion of the project with minimum clogging and leaks are true leaders. They also manage to get the right people under them to help them achieve their goals. A true leader needs to possess good plumbing skills! And usually all it takes is one good leader to change the fortunes of any organization. Try this small quiz as a sample; can you name two other people from the following organizations apart from their famous founders and co founders? Microsoft, Google, Apple, Facebook, Tata, Reliance, Wipro... etc, I guess you got the gist of it? My bet is, most of you can’t give more names, yet you believe in these organizations and what they have to offer you. This is the power of great leaders. They have things under control and even if they really are not under control they make it all seem like it is under control. What we lack at CWG is a great leader who can convince the people that it is possible. Even the much vilified Lalit Modi of IPL did wonders with his leadership abilities and probably is the only name one can think of from the management team of IPL. Take the case of E. Sreedharan who is the only name we know from the Delhi Metro project which is running ahead of schedule, quite a miracle by any standards. Take the case of GMR and the way they have delivered world class airports in quick time. Take MS. Dhoni and his mercurial rise to stardom. These are true examples of leaders with passion and determination. It’s not that India can’t deliver world class stuff, we are more than capable but in the hands of a wrong leader without foresight even the best of talent will seem pedestrian. So what about the games now? Will we be able to complete the work in time and will we host successful games? What is going to happen in the next two months? Will the foreign visitors enjoy and cherish their trip to India? To answer this we need to understand a little bit more about the idea of India. This I wish to discuss in my next blog post. Be sure to check back in a couple of day’s time to find out what i think is going to happen eventually with the games.